Memories from Betty Sue Leach Moore ….. I have many good memories of Union High School. Classroom teachers Florence McClung and Gethel VanStavern had a major influence on my life and future working experiences. I learned much from these two teachers. Like most of us at that time I enjoyed the extracurricular activities more than the classes……such as making cider as a fund raiser, selling ads for our yearbooks, acting in school plays, singing in the choir and participating in and attending sporting events and being a cheerleader. One fond memory is of sled riding on the hill behind John Kidd’s house. We would have two or three layers of clothing to bear the cold and ride those sleds down the hill with two or three on one sled. This might go on for hours before John’s mother had us come inside to warm up with a cup of hot chocolate waiting for us. I left Union at the age of 18 and never returned to live there but it is still “Home” and always will be. Memories from Julia Dillon Kanatzar ….. I remember….back then, my aunt Louise Massey standing at the door of her classroom at Union High where she taught Algebra, Physics and Chemistry. She also had to pick me up on many occasions and take me to school when I missed the bus and that was pretty often. Not many of us had access to a car…we either rode the bus or someone brought us to school. We wore the straight skirts and sweaters and penny loafers, hose (heaven forbid) and bobby socks…we were so with it, we thought. Jeans were not too cool in those days and certainly not as stylish as what we have today. I would have loved to have the cool jeans that today’s kids wear. How did we survive without the great athletic shoes of today? I think that we wore Keds, if I remember correctly. I remember the Snack Bar owned by Barbara Beckner’s parents on Greenhill road. What great hot dogs with chili and coleslaw. That was our only hang out in Union, in those days. Farmer’s Day was a big deal for us and still is….that was such a good time. I always knew that I would not live in Union, but I certainly gained a good foundation for life there. Memories from Margaret Glover Jones….. I have many amazing memories of my time spent at UHS. Because it was a small town and school, I had the opportunity to know most of the students. I cherished the many special friends I had. I especially remember all the fun band trips and sporting events. Our basketball and football teams were awesome – I remember all of the trophies they won at tournaments. I remember the fun times after the games. Getting together with everyone, just sitting around laughing, eating, acting “silly”, and of course above all, looking for guys! I remember how the teachers at UHS really cared for each of us and wanted us to succeed in life. I read through the 2003 reunion booklet “Now and Then” and am amazed at the different paths that our class has taken since 1961. I remember one morning in Mrs. VanStavern’s class (Bookkeeping & Typing), I came into the classroom, sat down and looked at the typewriter where all of the letters had been removed from the typewriter keys. I thought the world had come to an end but Mrs. VanStavern just laughed at me and said that I would be OK.
Another time that I remember was in Miss Patton’s class (World Geography), when a certain fellow who sat behind me punched me in the ribs and naturally, I yelled out. I was sent to the principal’s office. Mr. Allen just motioned for me to sit down on the chair. I sat there for a short time….it seemed like an eternity. Mr. Allen then said “Gene, you can go back to class now”. 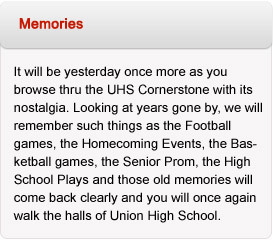 There are many good memories from our days at Union High School….some I can share…..some I cannot! Fond memories from my high school years are many, but a few stand out. Showing my first love and FFA project “Cricketts Paulette” at the State Fair where she won Grand Champion Guernsey……. or perhaps the memory of my one and only date with Linda Carol Anderson. In 1961, when I was President of the Future Farmers of America, I was able to present my dad with an Honorary Chapter Farmers Degree. I remember working in the Vo-Ag shop where Clayborne Campbell my favorite high school teacher taught me to weld. He also exposed me to all the other shop equipment. Even though I hold two US patents, BS and MS degrees….I am most proud to be a welder. The trade which has served me well all my life. Mr. Campbell started me on this wonderful adventure during my high school years and I am eternally grateful to him. I came to Union High School in the middle of 10th grade and never became involved in many activities, so I don’t have a lot of memories but I do remember English class with Miss McClung. I remember one day she told me that she was giving me a gold medal for being the worst speller in the class. She was a good teacher…..also Mrs. Massey, she taught chemistry and physics and I excelled in those classes. One of the things that I remember about Union High School was the sports…it was a very important part of the culture and the athletes were high in demand. Since I was small I was not very good at sports. I remember how good the teachers were… we had a teacher named “Flossie” ……..and did she straightened me out!!! And I will never forget the chemistry teacher, Mrs. Louise Massey. I was scared to death when I went to college…did not think that I would make it but for Union High School being a small school we all got a good base and I know it has served me well through the years. Mr. Allen was one of the best teachers that I can remember. As Principal, he knew how to keep the peace and he did it with grace and had no fear. Memories from Linda Boyce Moore….. Some of my memories during the UHS years include English class with Miss McClung and diagramming sentences, typing class with Mrs. VanStavern, making a skirt and blouse (which no one liked) in home-economics class, playing girls basketball when it was half court with Ruth Bostic as the coach. I remember the lemon lime sodas at lunchtime, being a cheerleader, the class plays, making cider, going out selling ads and working on the yearbook. I remember decorating for the junior prom and going to the Snack Bar and driving around town when gasoline was 35 cent per gallon. I also remember the tragic loss of a classmate Mickey Miller, during our senior year, due to a automobile accident during lunch time (off school grounds). Memories from Linda Elmore Cohernour…. As I remember back to my junior year in high school… going to my first class, which was Drivers Education….I opened the door and looked in, the room was full of junior and senior class boys….I thought, “How lucky can you get??? ?” What else can I say……I really enjoyed that class. I remember English class with Florence McClung very well. During the time we studied Literature we frequently had to memorize her favorite passages and in addition to that, we had to go to the front of the room and recite them. I remember when we had to memorize the poem “Annabel Lee” by Edgar Allen Poe. The memorizing wasn’t hard for me but to get up in front of the class and recite that poem…..I died a thousand deaths! Actually, I lived thru it and thru most of my life I have remembered that poem…and to this day, I can still recall most all of it. Most of all, my favorite memories are the good times spent at the Skating Rink in Union and the Union High School football games. In 1960 and 1961, our football players were outstanding. What exciting games! Also, one other thing… our class ring…..it didn’t matter if you wore it right or upside down, it still said 1961. Memories from Linda Short Stagg….. I think what stands out the most for me are the friendships I had and my mother was always amazed that as soon as I got home I would need to call one of my friends….probably Julia or Betty Sue….and we could talk for hours, the exciting basketball and football games (if my memory serves me correctly we had pretty good teams). Another thing I recall is how our teachers and the whole Union community and surrounding area was always so supportive of us as school kids….they watched out for us too. I do recall our class making cider with Miss McClung and throwing leaves, sticks and even rotten apples into the mixture. People bought our cider though and thought it was delicious. I remember the scared feeling I felt when we graduated, wondering if I could make it in that business world I knew so little about. Memories from Rhonda Wiley Hylton…..
My memories of Union High School goes back to our English teacher, Florence McClung. I was scared to death of this lady. I didn’t realize that she was such a good teacher until later on….and I wish that I would have had her all four years of high school. Instead, I only had her my senior year. Memories from Virginia Elmore Hellmondollar….. The most exciting thing I remember about high school was our senior trip to New York. This Monroe County girl had never been further away from home than Lewisburg. I had never been on a train, or spent the night in a hotel. Seeing the Statue of Liberty, China Town, Macy’s and the Waldorf Astoria was so exciting. The most embarrassing thing I remember was the day my little 6 year old sister went to school with me. I was a senior and she was in the first grade. She really hated school. I had to hold her hand all the way to the bus stop and until we got on the bus and when we got to Fairview school, I had to get off the bus and take her in and hand her to the teacher. I would then get back on the bus and go to Union. One day I couldn’t get her off of the bus so she had to go to high school with me.